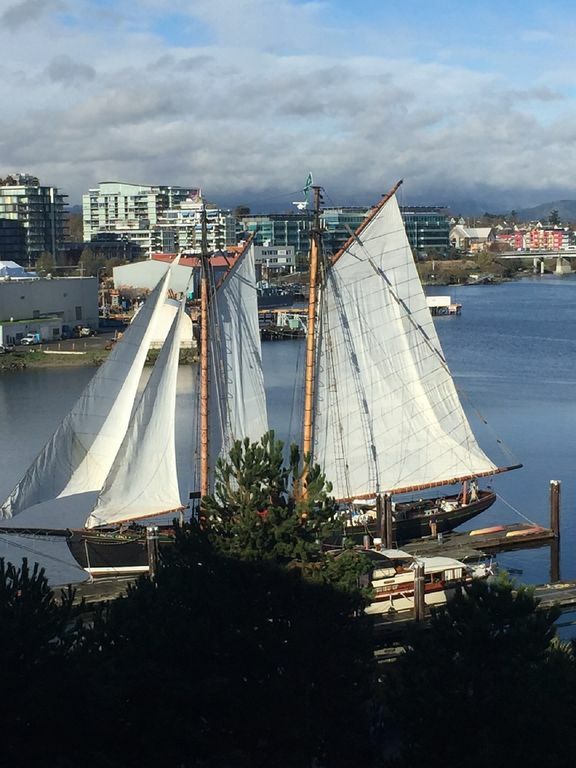 Enjoy the charm of "Old Town Victoria" in the convenience of a newly renovated modern waterfront condominium, situated on Victoria's beautiful Inner Harbour. View the harbour activity and the beautiful sunsets over the Olympic Mountain range from your bright and airy living room or the private roof top patio. Imagine a holiday where you sip your morning coffee while you watch the boats come and go. Take a leisurely walk to enjoy Victoria's fine restaurants, pubs, antique shops, quaint book stores and leave your car in its designated secure indoor parking stall because everything is within walking distance and you can now have that glass of wine. Enjoy your evening barbeque while watching the sunset from your private roof top patio. Want dessert or a change of scenery... take a water taxi (located outside the buildings front door) and explore the other side of the harbour, which includes Fisherman's Wharf and many other treasures. The security in this building is second to none so you can enjoy total peace of mind. Upon arrival and departure you will be personally greeted by our property manager at the condo, allowing more time for your many vacation activities, located just outside your doorstep. This truly is a remarkable location and a holiday meant for total relaxation. Fabulous location. Able to walk everywhere. Private rooftop patio overlooking working harbour. Elevator access to roof top patio if required. 550 sq ft Private Roof Top Patio which can be accessed from condo or via building stairs or elevator. Also common roof top area and BBQ. Living Room-Full-Height Windows, Leather Sofa, Cable TV/DVD and CD/Tape Player, Fully-Equipped Kitchen, Stove, Coffeemaker, European Dishware, Gourmet Cookware, In-suite Washer & Dryer, Bedroom-Open Design Affording Views of Harbour, Built-In Bed Frame with Queen-Size "Pillow-Top" Bed, Down or Hypo-allergenic Comforter, Luxurious Linens/Bedding, Iron/Ironing Board, Umbrellas, Bathroom-Soaker Tub/Shower, Hairdryer, Magnified Wall-Mount Vanity Mirror, Desk Area-Telephone with free Local Calls, High-Speed Wi-Fi Internet Connection, Private Roof top Patio - Teak Furniture, "Bar Style" Table/chairs for Optimum Harbor Viewing, Barbecue/Cooking Accessories, Patio Heater, Common area with BBQ, Secure Underground Designated Parking, Storage for Bikes/Kayaks, Handicapped Accessible with Ramps & Elevators, No Smoking and No Pet Policies in effect. We really enjoyed our month long stay (March) in this condo by the waterfront. This is a lovely property, well maintained and well situated. The decor is tasteful, and restful, and contributed to how comfortably we settled in - we felt right at home. Everything we needed for our stay was right at our finger tips. We really enjoyed watching the activity in the harbour from the living room or from the rooftop patio, and we often walked the nearby trails around the inlet or through the streets to the Inner Harbour and points beyond. The owners and manager were a pleasure to deal with. This is a place we would highly recommend and we would love to return to sometime in the future. We didn't want to leave !!!!!!! Glad to hear that you enjoyed your stay in Victoria and that our property met your expectations. Love this location! Its close to everything. Love this location! Its close to everything...but far enough away from the super touristy areas. We always try to find accommodations in this area when we visit Victoria. Close to amazing coffee shops, restaurants and bars but still walking distance to everything else. The condo was the perfect size for two .We made use of the rooftop deck numerous times! So great to be outside and relax with an amazing view. Very happy to hear that you enjoyed your visit to Victoria and your stay in our condo. Nice, clean, roomy and our host was very helpful. Great location overlooking the bay and secure underground parking for our car and bikes. This is a very clean Waterfront Condo that has everything you could want. Francis and Gary were great to deal with. Thank you Alistair & Charlene for a very nice stay. Glad you enjoyed your stay in Victoria and appreciated our condo. Beautiful apt with great amenities and incredible location! Appreciate your feedback, hope to see you back in the future. Whale Watching, Harbour Tours Within Steps of Marina View, Walking/Biking Trails Along Harbor Waterfront and Galloping Goose Trail for Outdoor Enjoyment, Yoga Studios/Day Spas Within Easy Walking Distance, Centrally located to enjoy cultural activities, festivals, sporting events, garden tours, Empress Hotel, Parliament Buildings and Chinatown, accessible by foot, Catch a sightseeing train to northern Vancouver Island destinations with depot just two blocks away, Floatplanes, ferries, heliport to Inner Harbour provide convenient transportation link to Marina View from Seattle, Port Angeles or Vancouver, Easy access to bus/taxi & harbour boat taxi, Airport shuttle service within 1 block of building, Boat moorage available at Mermaid Wharf Marina next to building, Your Condominium Building is surrounded by a wonderful assortment of casual and fine dining opportunities and live music for your entertainment! Rates and availability are subject to change until deposit has been received. Rates include all taxes, cleaning fees (4 night stay or longer) and designated parking stall within our secure building. An additional cleaning fee of $90.00 for stays of 3 nights or less. Late check-in fee of $30.00 is payable directly to property manager if late check-in requested. See cancellation policy.